The Bangles are an American pop rock band formed in Los Angeles in 1981. They scored several hit singles as that decade continued. 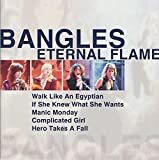 The band's hits include "Walk Like an Egyptian", Billboard magazine's number-one single of 1987, as well as two number-two hits, "Manic Monday" and "Hazy Shade of Winter", and their 1989 number-one single "Eternal Flame". Their classic line-up consisted of Michael Steele on bass and vocals, founding members Susanna Hoffs on vocals and rhythm guitar, Debbi Peterson on drums and vocals, and Vicki Peterson on lead guitar and vocals. The band currently consists of Hoffs, Debbi Peterson and Vicki Peterson, along with touring bassist Derrick Anderson (since 2008).